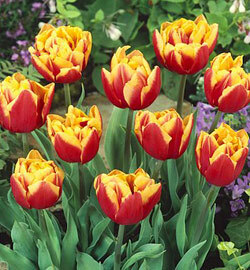 Create a carnival of color in the late spring garden with this exceptional tulip variety. Fully double blooms have petals of bright scarlet red with wide margins of rich, buttery yellow, on strong stems up to 20” high. The Double Late class of tulips are also known as peony-flowering tulips for their abundant petals and extravagant size. A sweet fragrance adds to their appeal. You’ll want to plant plenty for cut flowers and as an show-stopping addition to beds and borders. Order our premium, top-size bulbs today – we’ll ship for fall planting, and you’ll be treated to an amazing performance next spring.